This handmade wooden desk sculpture has a hidden surprise: Each bird is actually a pen. Emily Dickinson wrote, "Hope is a thing with feathers that perches in the soul." Whether you're following her lead and working a little winged simile into your poetry or simply writing your latest to-do list, these hand-carved pens let you do it in style. 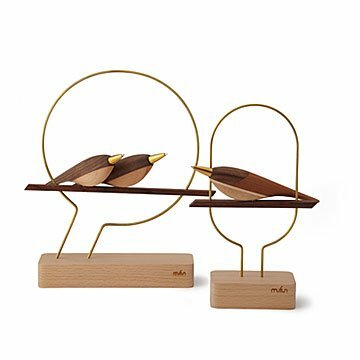 Made of walnut wood, each is crafted to look like a lovely little bird. Thanks to a magnet where the feet would be, they sit elegantly perched on a copper coil and walnut stand when not in use. A pretty (and very useful) bit of office decor when displayed on your desk, it also makes a fun gift for all the writers in your flock. Handmade in Taiwan.